Earlier this week Latino Decisions and America's Voice released a poll examining the reaction of Latino voters to the Supreme Court's recent U.S. v. Texas decision blocking President Barack Obama's authority to implement DAPA and to expand DACA (full results and crosstabs here). One thing is clear: The Supreme Court decision on DAPA has important implications for the 2016 election. Overwhelmingly, 83 percent of Latino voters favored DAPA and wanted to see it fully implemented. The issue of protecting versus deporting immigrant parents will certainly be relevant on the campaign trail. And as it stands now, Latino voters nationwide favor Democratic presidential nominee Hillary Clinton over Republican nominee Donald Trump by more than a 4-to-1 margin, 74 percent to 16 percent. The America's Voice poll also suggests that for many Latino voters the partisan politics surrounding the U.S. v. Texas case reinforce the diverging paths that the parties are taking with respect to immigration. When asked if Trump's support for the U.S. v. Texas decision would cause them to be more or less likely to vote for other Republican candidates, 62 percent said they would now be less likely to vote for GOP in the fall. In contrast, 62 percent of respondents indicated that Clinton's opposition to the 4-4 U.S. v. Texas decision made them more likely to vote Democratic. More generally, nearly half (46 percent) of Latino voters think the GOP has become more hostile to Latinos in recent years, as compared to 11 percent who think that the Republican Party has become more welcoming. 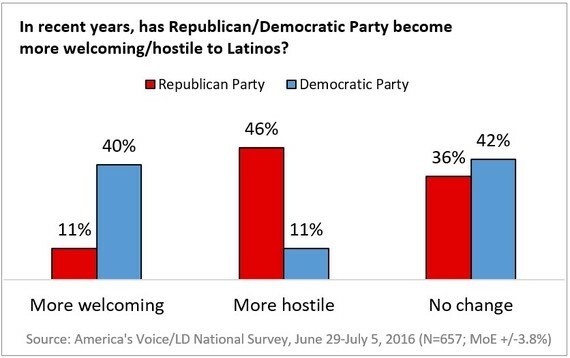 The opposite holds for the Democrats: 40 percent said the party has become more welcoming to Latinos. In terms issue priorities, immigration continues to be an animating issue for Latino voters. In response to an open ended question asking respondents what the most important issue facing the Latino community, 50 percent cited immigration reform. Moreover, the two policies at the center of the Republicans' legal challenge in the U.S. v. Texas case enjoy broad support among Latino voters. Specifically, 83 percent of Latinos approve of Obama's executive order DAPA and 81 percent approve of DACA. The continued saliency of immigration within the Latino electorate should not be much of a surprise. For many Latino voters, immigration is a personal issue as 59 percent of respondents know a family member, friend, co-worker or other acquaintance who is an undocumented immigrant, and over a quarter of Latino respondents know someone who applied for the DACA program. Perhaps the poll's most telling finding though is the degree to which U.S. v. Texas serves an important reminder of what is at stake for Latino voters this November. When asked if the outcome of the case made them more or less enthusiastic about voting in 2016 as compared to 2012, 54 percent responded that they are now more enthusiastic about voting in 2016. By comparison, in 2012 it was not until late October that polling by Latino Decisions found similar levels of enthusiasm for voting as currently exists within the Latino electorate. There is no doubt that the electoral climate produced by Trump and other Republicans has motivated many Latinos in 2016 as demonstrated by the large protest rallies outside Trump events across the country. Regarding the future of the Supreme Court, 70 percent of Latinos think that they would be worse of if Donald Trump were making appointments to the Supreme Court, while 62 percent of the sample responded that they would be better off if Hillary Clinton were to choose the next members of the Supreme Court. Given the Court's growing role on issues of immigration, civil rights, and voting rights it appears the U.S. v. Texas DAPA ruling has energized the Latino vote heading into 2016 presidential election. The poll also revealed that Latino voters' perceptions of the two presidential candidates are well entrenched. All respondents were familiar with the candidates and just 5 percent had no opinion of either Democrat Hillary Clinton or Republican Donald Trump. More significantly, while Trump may "love the Hispanics," the feeling is far from mutual. Only 17 percent of Latino voters have a somewhat favorable or very favorable opinion of the businessman and a remarkable 78 percent have an unfavorable view of the Republican nominee including 69 percent who view him very unfavorably. Clinton, in contrast, is perceived much more favorably: 63 percent of Latino voters have either a somewhat (27 percent) or very favorable (36 percent) opinion of the former Secretary of State, with only 32 percent viewing her as somewhat (12 percent) or very (20 percent) unfavorably. Given these perceptions, Clinton leads Trump 73 percent to 16 percent in a hypothetical general election match-up. In generic U.S. House and Senate contests, the Democrats also enjoy advantages of more than 50 percentage points among Latino voters. More generally, in both their evaluations of the presidential candidates and in their voting preferences in federal races, Latino voters are much more pro-Democratic as compared to the electorate as a whole. Given the concentration of Latino voters in swing states such as Colorado, Florida, and Nevada that are feature competitive Senate races this cycle, Latinos have the potential to not only tip the balance in favor of Hillary Clinton in these states, but also significantly aid the Democrats as they seek to gain majority control of the Senate. David F. Damore is a Professor of Political Science at the University of Nevada, Las Vegas and a Senior Analyst for Latino Decisions. Disclosure note: In August 2015, Matt Barreto and Gary Segura of Latino Decisions were hired as consultants to the Clinton presidential campaign, and are only working on candidate projects this cycle. The poll reported here was sponsored by America's Voice and was not coordinated, funded, or otherwise endorsed by any campaign, party, or political organization. Sylvia Manzano and David Damore directed this project on behalf of Latino Decisions.